The large double–door entrance to via Cimarosa 25 in the Vomero section of Naples was half–closed this morning, as is customary when someone in the household passes away. And, as is customary, a small white card was affixed to the door. It was written by hand and read, succinctly, "For the death of Roberto Murolo". He was 92. It was, perhaps, the only non–violent thing that could have happened in Naples yesterday to push today's visit to the city by the ex–royal family of Italy, the Savoys, out of the headlines. And it did. There are three main reasons why one–thousand miles of Italians, from the Alps to Sicily,know something about the culture and language of Naples. The first reason is the great playwright Eduardo de Filippo, on many a literary critic's short list of Those Who Should Have Got a Nobel Prize But Didn't. The second reason, on a more popular (and more vital) level, is Italy's greatest film comic, Antonio de Curtis, known simply as "Totò". The third reason is Roberto Murolo, the gentle and erudite chronicler of Neapolitan music and the best–known singer in the twentieth century of the "Neapolitan Song." If Murolo had simply been content to remain a guitarist and singer, he certainly would have done very well, but he was born to more than that. 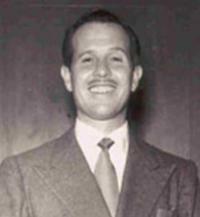 His father was the highly–regarded dialect poet Ernesto Murolo, part of the long tradition of dialect literature that included his own contemporary, Salvatore di Giacomo, and reached back through the 18th–century libretti of the Neapolitan Comic Opera to the 16th–century Pentamarone by Giambattista Basile, and beyond. Thus, Roberto Murolo was very aware of being part of that tradition, and his great contribution to the music of Naples is a scholarly one. 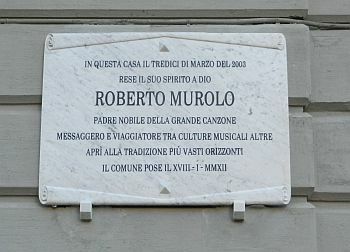 He dedicated years of his life to researching, collecting and documenting Neapolitan music and in 1963 published what amounted to a musical encyclopedia of the music of Naples, a 12 LP set containing songs from 1200 to 1962, all carefully documented and explained and all immaculately sung by Murolo, himself. He sang in the precise pronunciation of a literary language, quite different from the uneducated "street sound" that one often associates with the term "dialect". Update: Jan 2012. Earlier this month, the city put a plaque on Murolo's home to mark the 100th anniversary of his birth. It reads in part: "... messenger and traveller among different musical cultures, he opened greater horizons for tradition." Murolo is not the reason that Neapolitan songs such as 'o sole mio and Funiculì–Funiculà are known abroad. That goes back to yet an earlier generation, the years at the turn of the century when so many Neapolitans emigrated and took their music with them. Interestingly, however, Murolo was part of the post–WW2 generation of Neapolitan singers who resisted the onslaught of American popular music and helped keep the traditional music of his native culture from becoming passé. Although he became less active with advanced age, Murolo never really retired. He took part in the 1993 version of the annual Festival of Italian Popular Music in San Remo with a song entitled "L'Italia è bella," a song against racism and xenophobia. And while "cross cultural" music is run of the mill today, Murolo was doing that as long ago as 1974, when he sought out and sang with the great Portughese performer of Fado, Amalia Rodriguez. Murolo was an inspiration to the "friendly rivals" of his own generation such as Sergio Bruni and to the younger generation of singers such as Massimo Ranieri, Pino Daniele and Mario Maglione, all of whom published tributes to Murolo in the paper this morning. As with the passing of Eduardo de Filippo in 1984 and Totò in 1967, there is a very real sense of loss in Naples today.